Due to Little Bee’s allergies we won’t be able to get him a regular chocolate advent calendar and instead of getting him a dairy free one, we decided we would make one for him this year in addition to the book one we did last year using a selection of our own books, as well as some borrowed from the library. We were in a toy store recently and noticed that they had boxes of small world farm vehicles for a really good price so we ended up getting them to put into his calendar, we also got some dairy free chocolate coins and a few ‘make your own’ Christmas tree decorations from hobby craft. I have a mountain of crafty bits and pieces at home from years of craft projects and general magpie syndrome. I can never resist random sticky letters, pom poms, sequins, washi tape, colourful string and pretty much anything that sparkles! A trip to hobby craft normally requires a small bank loan! However this means I have a small treasure trove of goodies for projects such as this. So I got busy Wrapping and numbering each little gift. I had been looking on Pinterest for homemade advent calendars and there are a tonne of ideas on there. I spied a couple I quite liked and took some ideas to create my own. 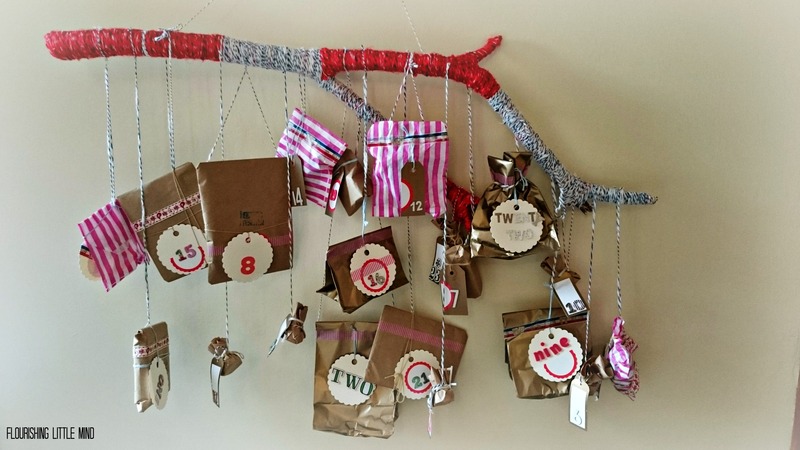 I decided that little bee’s advent calendar would hang on the wall from a stick! Weird I know but the ones on Pinterest looked amazing! So a trip to the woods to find a suitable stick was on the cards.. Cue pulling on our wellies and rain coats for a mini adventure in the great outdoors. After a good gander through the woods we found a good sturdy stick to take home and clean up. Once clean and dry I wound wool around the stick to jazz it up a little. This created a nice finish although I think leaving it naked would work well too. Once covered in wool I added the small wrapped and numbered gifts by hanging them with wool onto the stick. I also added a piece of string for hanging the calendar on the wall. Ta da.. So there you have it! Our handmade advent calendar. Perfect if you’re looking for something a little different to surprise your little one with this Christmas.